...if this sort of nonsense spreads. Spontaneous performance, meet Regulation. Let the market decide, say I, a life-long socialist. 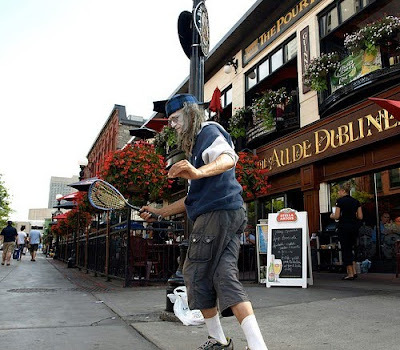 Drop a loonie in the hat of the street-musician or juggler who pleases you. Not all of them will. But now they must be registered and licenced and given time slots in specific locations. And the cost of the licence alone will ensure that the riffraff don't get to play. Let them go back to panhandling: by-law officers will be standing by in case they whistle or break into song. We even have a busker festival in Ottawa. Put it all in a box. Control, control. Keep it down to five days. Beggars under glass. 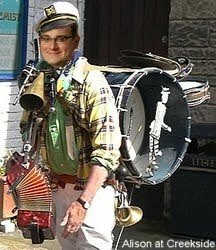 I say let the buskers busk, if that's what they do. It's freedom of expression at its most harmless, and even, surprisingly often, a positive aural experience on a summer's day. I'll make common cause with anyone to push back the joyless bean-counters, regulators and fee-collectors who want everything and everyone pigeon-holed, listed and taxed. This page contains a single entry by Dr. Dawg published on April 3, 2010 10:33 AM. "Uppity" Black woman targeted by bloggers was the previous entry in this blog. Amnesty International and the intellectual dishonesty of the Right is the next entry in this blog.